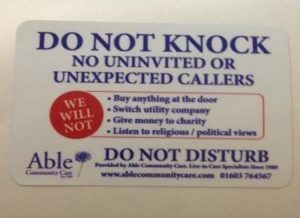 Able Community Care has had printed the above door sticker which we are offering free to individuals or older people’s groups. Statistics show that older people are being continually tricked by fraudulent tradesmen turning up on their door step. If you would like to receive a number of the above door stickers free of charge, please reply to this email giving us your postal address and the number you would like. You can also call us on 01603 764567. Able Community Care is a nationwide provider of Live-in Care Services. Established in 1980.